The Scandal relief and the Melchett fire basket (M.16-2005) were commissioned together by Henry Mond and his wife Gwen, later the second Lord and Lady Melchett. This ensemble was one of the most important artistic features within the remodelled interior of Mulberry House, considered at the time one of the most important Art Deco interiors in London. The Mulberry House renovations of 1930 were recognised to be one of the finest achievements of a fruitful collaboration between interesting and enlightened patrons, an innovative architect and a painter and sculptor, the latter two Royal Academicians and of outstanding importance in Britain. The reunification of these two exceptional works of art considerably contribute to an enriched and deeper understanding of British decorative arts of this period. Charles Sargeant Jagger (1885-1934) has come to be regarded as one of the most outstanding British sculptors of the first half of the 20th century. In 1921 he was elected a member of the Royal Society of British Sculptors, which subsequently awarded him two gold medals. In 1926, he was made an Associate of the Royal Academy. He received both public and private major commissions until his career was abruptly terminated by his premature death in 1934. His most famous public commission was the Royal Artillery Memorial at Hyde Park Corner (1925). This is his masterpiece, while his most celebrated corporate commission was for the sculptural additions to the façade for ICI House, Embankment (1927). Unquestionably his most accomplished private commission was the Scandal relief and fire basket for the drawing room of Mulberry House, Westminster (1930). The Scandal relief, along with the fire basket were commissioned by Lord and Lady Melchett from C.S. Jagger in 1930. Henry Mond, the second Lord Melchett, died in 1949 and the relief remained in Lady Melchett's possession until 1980 (she died in 1982) when it was acquired by the dealer partnership of Jo Martins and Bruno Forrest. Bruno Forrest lent it to the Imperial War Museum exhibition, Charles Sargeant Jagger, War and Peace Sculpture, in 1985 and in 1986 consigned it for sale to Sotheby's where it was sold for £17,000 (Applied Arts from 1880, Sotheb'ys, London, December 19, 1986, Lot 65 . 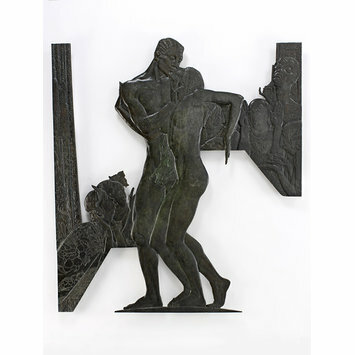 The relief was acquired at this auction by the Chiu Gallery of the Halkin Arcade, Belgravia who sold it to Robin Roberts, an American citizen, on January 22, 1987 for £40,000. There is no evidence that an export licence was applied for or issued although it would have been required. It remained in the possession of Robin Roberts in New York state until his death in February, 2003 and was consigned for sale at Christie’s New York by his sole executor, Maurice Bernstein (Property from the Estate of Robin Roberts, Christie's, New York, December 18, 2007, lot 448). The hammer price was US$ 130,000; the purchase price including buyer's premium was US$ 157,000. Historical significance: REPORT (submitted to the V&A Collections Committee, 2007). Cast and patinated bronze, in four sections which are attached to each other at the back by a series of bolts. 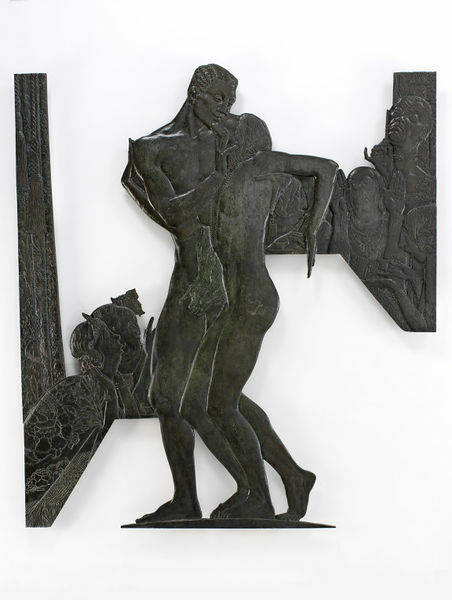 The relief depicts a naked couple embracing with an audience of disapproving elders in the background, signed in the maquette C.S. Jagger, 1930, 182 x 165 cm (approximately). This relief is the companion piece to the Melchett fire basket, also by Jagger and dated 1930. Both the relief and the fire basket were commissioned by Henry Mond, later the second Lord Melchett as a part of a decorative remodelling for the drawing room in Mulberry House, Smith Square, Westminster. The Melchett fire basket was sold at Sotheby’s, London, (5 October 2004, Lot 125 for £66,000 to a US client. An export licence was subsequently applied for and the case was heard on February 5, 2005 (DCMS reference: PAE/01766/04, Case 40). A temporary suspension of the licence was obtained for four months during which time, the V&A successfully raised the purchase price (£66,000) with support from The Friends of the V&A (£30,000), The Art Fund (£25,000), and the Central Fund (£11,000). Its museum number is M.16-2005. These objects are highly original works of art, signed, documented and dated, rich in symbolism and formed an integral part of an opulently decorative interior, designed in 1930 by the architect, Darcy Braddell (1884-1970) for Mulberry House, the home of Henry Mond and his wife, Gwen. This commission was reviewed by Professor C.H. Reilly in Country Life (June 6, 1931, pp.736-8). His observations underline the importance of the fire basket and its integration with the total scheme. “In the drawing-room. A fine apartment about 36 feet long by 26 feet wide, with three long windows on one side to Smith Square and two at one end to South Street, he [Mr.Braddell] has remodelled the walls and ceiling and, with the help of two Academicians, Mr. C.S. Jagger the sculptor and Mr. Glyn Philpot the painter, has brought into existence what must be one of the boldest, most complete and original schemes of decoration of our time. The fire basket which is illustrated in Professor Reilly’s article continues the theme with its related iconography. Commissioned for the drawing room (it bears the initials HM and GM on the shields round the basket) and directly relates to the gilt bronze and marble relief Scandal that hung above the fireplace. At the back of the fire basket, Jagger depicted in shallow relief two snarling cats hiding behind female masks to signify the “double face” and “cattiness” of society gossip. In the centre, (also in shallow relief) is a macaw, probably moulded on Jagger’s fierce pet parrot “Bill” to make play on the idea of “parroting” phrases without thought for content or meaning. Henry and Gwen Mond commissioned Scandal and the fire basket as a humorous reference to their early ménage à trois with the writer Gilbert Cannan. In Scandal the “guilty” couple stand naked before outraged onlookers who peer at them with hands raised in horror. To match the mixture of motifs in the Philpot murals, Jagger arranged the figures of the lovers in a dynamic zigzag composition, flattened against the composition in a playful reference to an Assyrian relief. This archaic element, repeated and echoed in the design for the fire basket, indicates the extent to which Jagger had begun to take a more decorative approach to sculpture and anticipates changes that were to emerge in his late monumental works. The strongly Art Deco element in the relief and the fire basket firmly established an element of radical modernity to the whole scheme, challenging accepted conventions in interior decoration. This challenge reflected the Monds' scandalous liaison which further challenged society’s rules not only by its unconventional nature but by being a love-match between different classes – Henry heir to the ICI fortune and Gwen, a colonial, from an unknown South African family. In 1918 Henry Mond had a motorbike accident outside the St John’s Wood studio, occupied by Gwen Wilson and Gilbert Cannan. Cannan was a writer of some distinction with a growing reputation, (he was rated by Bernard Shaw and John Galsworthy to be superior to his contemporary D.H. Lawrence) but Cannan was already showing signs of mental instability. Following the accident, Gwen insisted on nursing Henry until he was fully recovered and by default, he became their lodger. They set up a ménage à trois. Gwen Wilson had come to London to study at the Slade with Henry Tonks and Phillip Wilson Steer and had been Cannan’s mistress for about three years when she met Henry Mond. As well as their unconventional domestic arrangements, gossip was generated by Cannan’s further notoriety as he had been cited as the co-respondent in the well publicised divorce case of J.M. Barrie and his wife Mary. The decree nisi was finally granted on October 13, 1909 and Cannan, against the advice of all his friends married Mary Barrie on 28 April, 1910. The marriage did not flourish and the couple were finally granted a judicial separation in 1918, the year that Cannan fatefully met Henry Mond. In the autumn of 1919 Cannan went on a lecture tour of the USA leaving Henry and Gwen together. Their marriage in his absence only advanced Cannan’s mental deterioration. Gwen remained protective; a condition of her marriage to Henry was that she was to continue to care for Cannan. His mental health continued to deteriorate and Henry paid for Cannan to be treated in an asylum. In 1924, his mental health broke down irrevocably and he became a permanent patient at The Priory, Roehampton. He died in 1955. The Mond family were important patrons of the arts. Sir Alfred Mond, financier, industrialist and politician, the first chairman of Imperial Chemical Industries, the father of Henry Mond and the first Lord Melchett, was an influential patron of Jagger throughout his career. As Minister for Works and Chairman of the Imperial War Museum, he was instrumental in securing Jagger’s appointment as an Official War Artist in 1918 and crucially, directed Jagger’s appointment as the sole sculptor for the allegorical figures that were to be placed on the fifth floor balustrade for the new ICI headquarters at Millbank, built between 1928 and 1931. Apart from his series of war memorials which have defined Jagger’s career and for which he is justly famous, his work for ICI House was one of Jagger’s most important commissions. Henry Mond, the only son of Alfred Mond, was born in London on May 10, 1898. Educated at Winchester, like Jagger he served in the First World War and was wounded in 1916. He originally had ambitions to become a writer and poet but unlike Cannan, he had no particular literary talent although later in life he was to show some skill as a political writer. His father disapproved of his literary ambitions as he did of his son’s menage á trois but he still continued to support him. Mond’s social circle reflected his artistic ambitions and included artists such as Jagger, Glyn Philpot, Edward Seago (1910-74), Augustus John (1878-1961) and skirted the fringes of the Bloomsbury circle, all of whom were in temperament or sexual mores, outsiders within the establishment. This reflected the Mond’s own ambiguous relationship with society. Respected for immense wealth, the Monds suffered racial discrimination due to the family’s Jewish heritage. This was a contributing factor to the motivation behind the Mulberry House commission. After his marriage to Gwen in January 1920, Henry Mond began to display a distinct talent as a financier in his father's various businesses. Henry eventually became deputy chairman of the corporation his father founded, ICI, (1940-47), a director of the Mond Nickel Company as well as a director of Barclays Bank. He was elected a member of parliament as a Liberal for the Isle of Ely from 1923 to 1924 but left the Liberal Party and was returned to parliament as a Conservative in 1929 for East Toxteth. He vacated the seat on the death of his father and his succession to the peerage the following year. Thereafter he concentrated on economics and industry. He died in 1949. Charles Sergeant Jagger was born in Kilnhurst, near Sheffield on 17 December, 1885. His father was a local colliery manager and Jagger was educated locally until the age of 14 when his father apprenticed him to Mappin & Webb of Sheffield as an engraver. Although at the time he felt his artistic talents cramped by the requirements of commercial engraving, Jagger was later to acknowledge that his experience at Mappin and Webb had some lasting benefit in inculcating him with an attention to detail, it was this apprenticeship which led to the highly skilled use of bas relief that is such a prominent feature of the Mond commission. While still an apprentice, he attended classes at the Sheffield Technical School of Art, one day a week, in line with the national education policy, as well as attend evening classes in drawing and modelling in which he excelled. In 1905, at the conclusion of his apprenticeship, he left Mappin & Webb to become an engraving instructor at the Sheffield Technical School while continuing with his evening classes. In 1908 he was awarded a scholarship by West Riding Council to study at the Royal College of Art where he studied until 1911 sculpture and modelling under the distinguished sculptor, Professor Edouard Lantéri. He became Lantéri’s studio assistant and instructor in modelling at Lambeth School of Art, 1912-14 and in July 1914, he was awarded the British School at Rome’s two year scholarship in sculpture. He served in the First World War in the Dardenelles and the Western Front, getting wounded three times, the last seriously. Between 1918-19, he was made an Official British War Artist for the Ministry of Information. Following the war, he undertook numerous war memorial commissions of which one of the most famous (and regarded by many as his masterpiece) is the Royal Artillery Memorial at Hyde Park Corner, completed in 1925. He was elected a member of the Royal Society of British Sculptors in 1921 and awarded a gold medal by the Society in 1926. That same year he was elected as an Associate Member of the Royal Academy. Between 1927 and 1934 he received important commissions from Imperial Chemical Industries and the British administration in India. In 1932, he was appointed a member of the Royal Mint Advisory Committee on Coins and Medals and the following year he was awarded his second gold medal by the Royal Society of British Sculptors. He died, unexpectedly of pneumonia on 16 November, 1934. The bronze relief, Scandal and the fire basket are rare survivors from an important 'Art Deco' interior. They are fascinating examples of the creative opportunities resulting from the patronage of the Mond family who had an outstanding record of the collecting and patronage of the visual arts in Britain. Possibly cast by A.B. Burton for Mulberry House, 36 Smith Square, Westminster, London. This has been suggested by Dr. Jonathan Black, Senior Research Fellow in the History of Art, Kingston University in an email of 10/12/2007 to Marjorie Trusted. "I strongly suspect Jagger would have had "Scandal" cast by A.B. Burton of Thames Ditton. He used this firm from ca.1921 onwards and for the bronze figure he immediately used after the "Scandal" project - the figure of Shackleton for an exterior niche on the Royal Geographical Society (1930-32). I believe Jagger liked Burton's as a foundry because of their skill with patination."